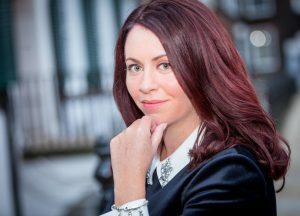 Welcome to Alice Feeney, author of Sometimes I Lie. Thank you, Ruby, for inviting me to share some of my favourite reads for My Life in Books. I’ve been a bookworm ever since I was old enough to read, so it was very difficult to choose just ten! So difficult that I might have had to cheat. Here are the ten (ish) books that I think were the most influential on me as a writer and reader. I was named after my Nana, which I’ve always been rather pleased about. I can remember having this book read to me and then re-reading it myself as soon as I was able to. I found Alice in Wonderland fascinating, and I distinctly remember sometimes thinking, as children do, that the story was about me. As an adult, I still frequently feel like I have fallen down the rabbit hole. The imagination in the stories by Lewis Carroll captivated me and I think this kind of storytelling is nothing short of magic. My parents owned a shop when I was a little girl, and when they were working I would sit in the little room at the back, reading stories as well as scribbling my own on folded up pieces of photocopy paper. I loved pretty much everything by Roald Dahl, but Matilda was always my favourite. I think that love of books at a young age and the way I used them to travel somewhere else, sparked something inside me to want to write stories of my own one day. A book can take you anywhere if you let it. I read this book for my English Literature A-level. I realise we’ve skipped a few years since the little girl sitting in the back of her parent’s shop, but if I’m only allowed ten books it seems necessary. This book had a profound effect on me for so many reasons. The story, the writing and my reaction to it, both at the time and since, mean it has to have a place on this list. Animal Farm was a very close second for this spot. I read a lot of books by Stephen King when I was a child, and I think that may have influenced the dark nature of what I write about now. 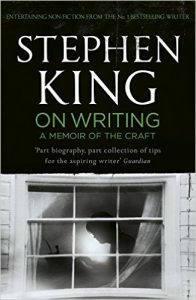 I’m a huge Stephen King fan, but the book of his I’m going to choose for this is On Writing. When I turned thirty (quite some time ago now), I decided to try and write a novel for the first time. I had a great job working for the BBC, but it wasn’t what I really wanted to do. I bought this book and I’ve read it many times since. I would recommend it to anyone who wants to be a writer. It will teach you many things, including how important it is to never give up. I love this book. 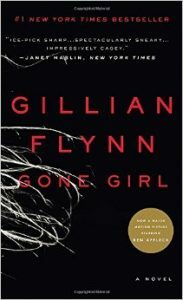 I love everything by Gillian Flynn. I saw my novel next to hers on a shelf in a bookshop the other day – I was so happy I almost cried. That is all I have to say about that really. She is the queen of this genre for me. If you enjoyed all her books as much as I did, check out her short story – The Grownup. It is just as brilliant. I can remember devouring this book. It is so dark, but so very beautiful. And that was the lesson that I think I needed to learn – that it’s ok to write from that dark place that lurks inside us all. 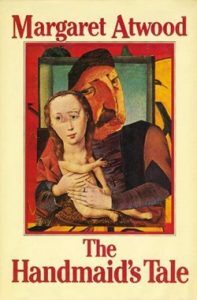 For me, this book is a classic, with a narrative voice that is both beautifully written and impossible to forget. Emma Donoghue also wrote the screenplay for the film of her book. I think it’s quite rare for authors to do a great job of adapting their own novels for screen, but she nailed it. She is an amazing writer. This was the first book by Maggie O’Farrell that I read, I’ve read plenty more since. There is something about the way she writes that captivates me as a reader long after I’ve turned the final page. I recently read This Must Be The Place which was equally spellbinding. Maggie O’Farrell is one of the authors I would love to meet one day, if only in the hope that some of her greatness might rub off on me. I loved this book too. 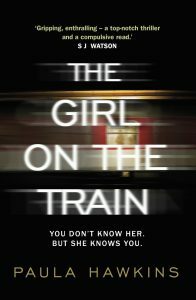 I still clearly remember turning to the last page and reading that Paula Hawkins had been a journalist for fifteen years before turning her hand to fiction. I had been a journalist at the BBC for exactly fifteen years when I read those words and it gave me hope. It felt like a sign to keep going, despite the failed attempts and growing collection of rejection letters. Another year of writing, and a new novel later, I got my agent. The best agent. So this book will always mean something special to me. I love my dog. He is my writing companion and keeps me sane (enough). 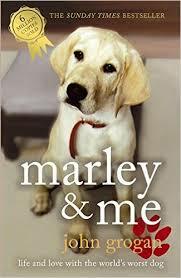 This is my favourite book about a dog. If you have never read it, you’ll need tissues. This was the last book I read before starting the Faber writing course. I was completely blown away by this novel and I remember thinking at the time, if only I could write a twist as good as that one day. When my agent got in touch to say that Clare had read my novel, I cried. To have a writing hero read your book is amazing, to have them say something kind about it and have their quote on your front cover is just the best thing ever! I read this last year and I’m still thinking about it now. I’ve fallen completely head over heels in love with Elizabeth Strout’s writing since, gobbling up as much as I can. 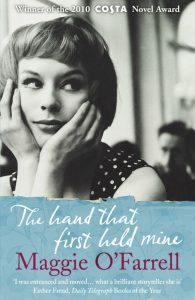 I think she is an amazing storyteller, and this might just be my favourite book of all time. Given I live in a house full of books that I love, that’s quite something. 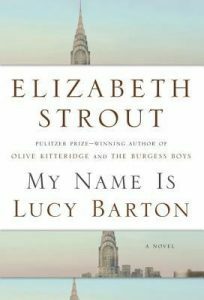 When I grow up, I would very much like to write like Elizabeth Strout. Sometimes I Lie is Alice Feeney’s debut thriller and is being published around the world in 2017 and turned into a TV series by Legendary Entertainment.